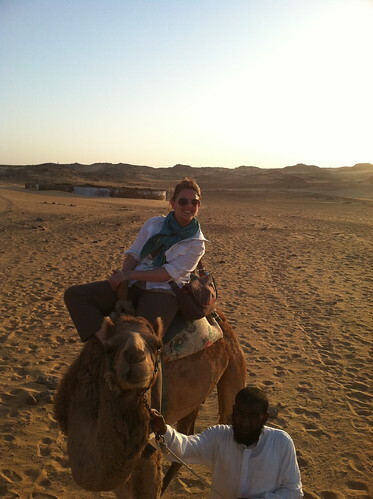 “Er-min-a-boo!” This is how I greet the man who is about to guide me through the desert on a camel. After a brief confused pause, he looks at our Egyptian guide and asks, “You taught her to speak Nubian?” That actually exhausted 50% of my Nubian vocabulary, but this type of insider’s knowledge about Egyptian culture (and history) made our 2012 Majesty of Egypt tour a truly unique experience. At the great pyramids, Bob Brier pointed out inscribed blocks attesting to the builders’ pride in this monumental building project. This detail vividly filled out the ancient social context: powerful rulers with the ability to efficiently apply vast resources towards their own monumental funerary monuments, and free members of the society proud to be a part of it! Set on the edge of modern politically vibrant Cairo, the juxtaposition is thought provoking. On a separate note, for someone with a degree in Greek archaeology, the solar boat museum was unbelievable. 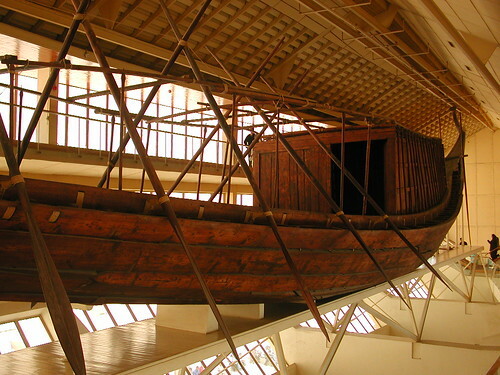 A complete, millennia-old, wooden boat! Nowhere else in the world could this be preserved! In Luxor, forward in time and up the Nile, we witnessed the cutting-edge technology of the Epigraphic Survey of the Oriental Institute of Chicago, reconstructing the history of Medinet Habu, one of the most important sites for connecting Egypt to its greater Mediterranean context. Mingling with the researchers, conservators, artists and stone masons shed light on the often invisible but crucial process of archaeological fieldwork. Bob and Pat standing in front of a male statue describing how we can tell if it is Queen Hatshepsut or a male Pharaoh, prompted thoughts on perceptions of reality and framing history. It made me realize how impossible it is to approach Egypt looking for “The” belle époque of Pharonic Egypt or Islamic Cairo. Because so many different historical periods coexist, they enrich our understanding of all of them and the present, which (to me) makes Egypt so special. I guess such a meaningful dichotomy makes sense in a land where the contrast between the Nile valley and the desert has shaped life for Millennia.